The Texas Elders is a part of the South Central Region of the Mankind Project. There are over 10000 men in Texas and Louisiana who have gone through the New Warrior Adventure Training Weekend over that last 23 years. The MKP Elder community host events for men in the community as well as all other men who are interested in learning growing and connecting with other men. We invite you to join us on a journey of discovery in the ancient wisdom tradition of growing as a man. It’s free. Just show up to learn, reconnect with, and make new friends. All men are welcome. The Elder community of The Mankind Project is hosting this series of experiential topics of interest to all men on the 2nd Saturday of the month. 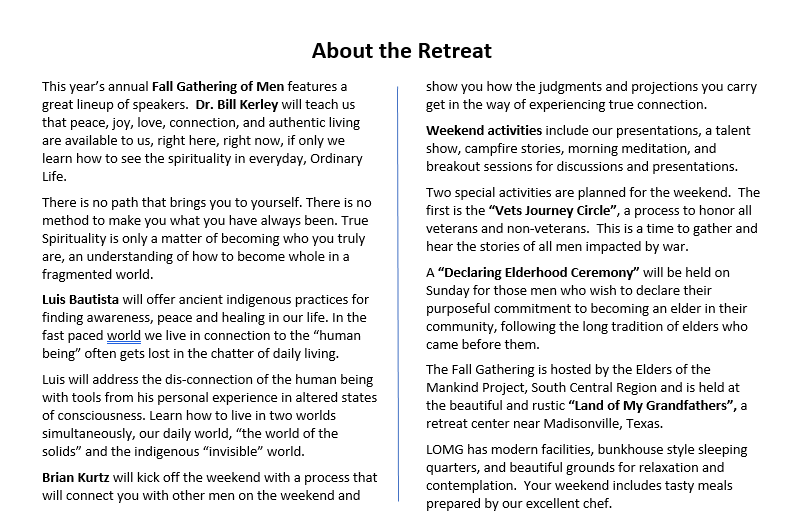 Men in our community will facilitate topics of their choosing that will support other men’s growth.Plan to attend the Fall Gathering of Men in Fall 2019. The meeting is held the 2nd Saturday of each month from 930-1130. We will meet at The Council on Recovery located at 303 Jackson Hill St. Room B167. Houston, Texas. Learn about our NEXT EVENT. 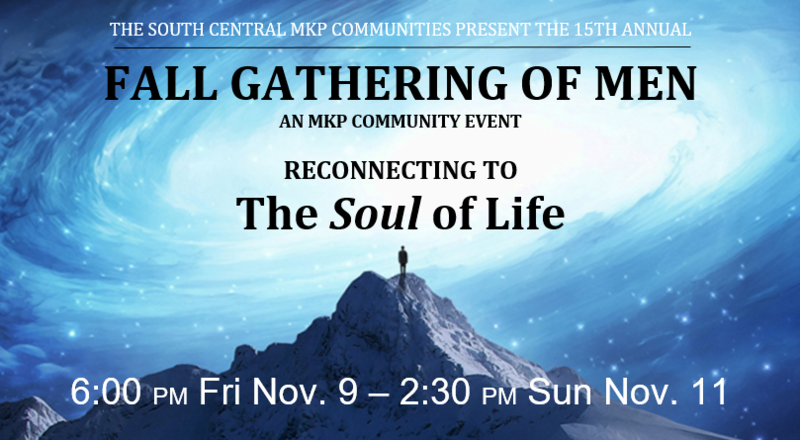 For the last 15 years the MKP Elders have hosted a Fall Gathering Weekend at theLand of My Grandfathers retreat center in North Zulch Texas. 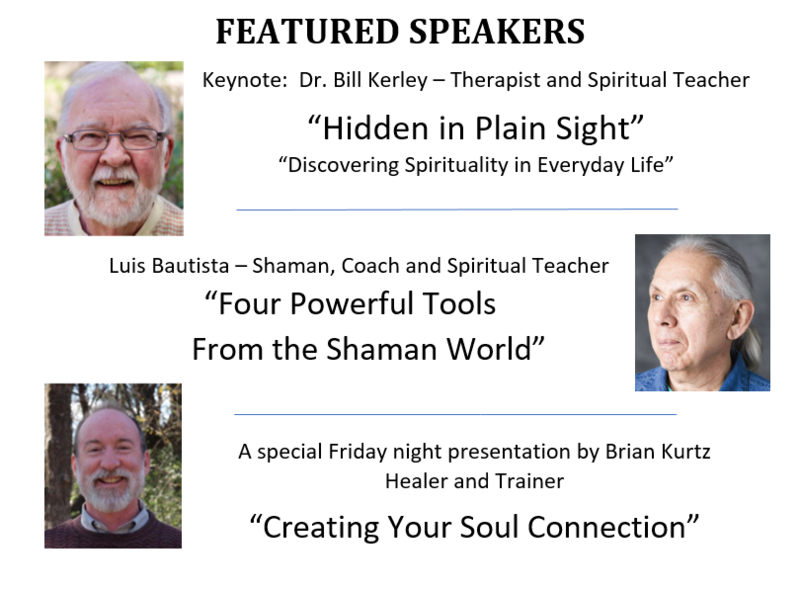 Speakers have been thought leaders in spirituality and psychology and Men’s studies. An attitude of openness, understanding and learning. Guitars, drums bedding/sleeping bag, flashlight and camp chair. A sense of peace, serenity, and connection to other men.